We can supply customers with many different options and solutions to meet their requirements, whether it's composite material or stainless steel our engineers will utilize the best material for the application. Value added items like piccolo cushions, which give straight line deceleration instead of the typical step cushion design. Integrated counterbalance and pilot operated check valves with hardlines reduce the number of required purchased items and increase the inherent safety of the hydraulic system. Hydratech has supplied product around the world in the aerial lift, boom lift, motion base rides, refuse truck, concrete pump, off-shore drilling and heavy construction equipment industries. Let our engineers help with the design and specification required for your applications. We care about you and your products. We provide cylinders of the highest quality at competitive prices, made by a crew of people who are passionate about cylinders. 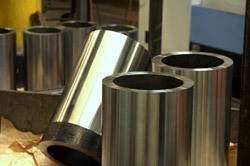 We design and manufacture custom cylinders for special or exceptional actuation applications. Our quality products can help your company provide better performance and reliable service for your customers and end users.